The difference between Kimo’s Kodokan and the Shoreikan in Ochoa was, for all practical purpose, none. The syllabus up to black belt was the same, with added katas that Kimo picked up from various other teachers, including Toguchi (Kakuha), which were taught after black belt. 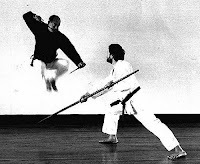 Kodokan’s distinction was Kobudo that Kimo learned under Matayoshi. The difference was in how the class was conducted. I dare say that Kimo didn’t put too much stock in belt rank aside from the material taught. As soon as I learned the nuances of how he wanted the katas done, was up to speed in my physical condition, and refreshed all the programmed kumite and bunkai drills, I was given my green belt back in 10 months. Kime was crucial, not so a perfected style. Discipline was based on respect and courtesy. Kimo was hands on, but at the same time hands off. Coaxing instead of coercing. The higher the rank, the more respect was demanded. Everybody practiced together, so lower belts constantly saw classic kata performed. No secrets. You were expected to train your material and any belt higher than yours was expected to answer questions and clear up doubts. Every so often all the kata syllabus was done and the ranks would sit down in progression, and Kimo would be the last one left standing as he did one of the classic katas alone. I mention kumite and bunkai and must clarify that within my Goju training this was not free fighting or a portion of a kata done as a drill. A kata bunkai was the entire kata with another person and lasted as long if not longer, exchanging attack and defense in a prescribed manner. Kumite were normally six technique drills and there were six to eight kumites spread out through the different ranks that would progressively become more complicated and intense. You were graded on these as if they were katas. In all, the kumites would include techniques from all the katas up to Suparinpei. These kumite and bunkai drills were done in two lines facing each other, switching partners constantly and everyone took part. As the ranks reached their material, they would go elsewhere to continue their training under a senior student. This would mean that in any given night a lower belt would be doing 100 plus kumites with people of their own rank and higher. Kumites and bunkais done by brown and black belts would seem to be real combat. Knowing the drill allowed higher ranks to fully attack knowing the partner would know where to block. Control was important. Injury was avoided by having intense kumite only between a lower and higher rank. Brown and black belts. Lower ranks, meaning anything below green, were allowed then to attempt a real strike. It is hard to explain since I’ve never seen anything like it in other styles. It is not your one or two step parry and counterpunch, but a continuous give and take. These drills could go on for 30 minutes or so. They were exhausting and trained your focus. Pauses in dojo training were minute, mainly a moment of transition you would go from one thing to another seamlessly non-stop. You trained your stamina and how to apportion your energy. The higher you would go up in rank the more intense the training. A brown belt could be more than 45 minutes doing katas in every direction. These drills were done every day you went. You finished training drenched in sweat, sweat over sweat. You learned how to move your energy around just to survive. If you felt sick you could ask to sit down in zazen until you got yourself together and went in again. Then after all was done, meditation. Arigato gozai mashita.